First things first: Thank you all for the encouragement after my slight freak out post on Monday...I'm surprisingly relaxed about the upcoming race, even though I will be wearing a boring old white visor. (While I liked Lori's idea to dye it with a box of Rit, I could just imagine my sweat mingling with the color and having that stream down my face during the run - it would be just my luck. Although, it would make for a memorable finish-line picture, that's for sure!) Anyway, I've gotten my three training runs in for the week and will be resting my legs in anticipation of Saturday. That's all I can do, right? So....on Saturday, my running club had a six-mile long run planned. It was an out-and-back, which I like, because I recognize landmarks and can tell how close I am to being done. Oh sure, I could look at Ricky Bobby and see that I've gone, say, four miles and know that I only have two left, but I like the visual. There was a much smaller group this time, and I think there were only five of us in the full group. I followed one man for about 2.5 miles before I ended up passing him. I actually prefer seeing someone ahead of me - even though we aren't running together, it still feels like I'm with someone. Once I passed him, I was on my own - the other fulls were way ahead of us. I practiced drinking every mile (water or Powerade), and at miles three and five, I ate a few Sharkies, which are kid's sports chews. Now, I know that this is probably mostly psychosomatic, but I swear they gave me a burst of energy and I felt great for about the next half mile...then I just felt normal. I also liked that they were really soft and very easy to chew - kind of like the softest gum drop candy you've ever eaten. And we all know that I love sanctioned candy - sure, I could have had a GU, but ick...I just can't make myself eat those things. Anyway, it was hot and humid but I surprised myself with a good steady pace and finished my six mile run in 1:12 - my average pace was 12 minutes per mile on the nose! Six miles! In a row! Without stopping! Ricky Bobby says "Good job!" 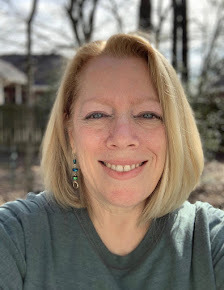 On Monday I ran for 35 minutes - it was a beautiful 57 degrees! Ahhh, so nice! On Tuesday, Jenny and I got together for a 30 minute run - I hadn't run with her for a couple of weeks, so we had a lot to catch up on. And today I ran with Matt for 30 minutes - another beautiful, cool morning! Now it's rest time for my legs (especially the left one - why oh why does it hurt when the right one doesn't?) until Saturday's race. Oh! I forgot to tell you - I finally bought a pair of 10-lb. dumb bells and have been working my arms, chest and shoulders. Let me just say that there is a big difference between using the exercise tube and dumb bells - my arms are actually a little sore! But in a good way. And I did 50 push ups and 100 crunches last night while watching the Biggest Loser, in solidarity to the torture the new contestants were being subjected to by Bob and Jillian. ***You have a couple of days left if you want to enter the baby gift basket giveaway from Oh! Nuts - click here and leave a comment saying either "pink" or "blue" for the color you'd choose if you win. Roll, Ice, Motrin. Repeat until Saturday. You ran six miles in a row without stopping! That's my dream right now! So excited to watch you do iiiitttttt! That means there's hope for me! Wheee! That is freaking unbelievable! Can you believe how far you've come since you started LESS THAN a year ago??? Can hardly wait for the race report. This will be the best one yet!!! Wow. That's all I can say. Wow! SIX MILES!!!!!!!!!!! Can't wait until that's me. I usually swim while biggest loser airs and have to wait to see it the next week online :) so a lot of us probably workout with them in solidarity. nice thought! :)I never even heard of biggest loser until like a year into me starting to swim again. Great job on the running! How proud I am of you! Wonderful run, Shelley. The thought of dye running down your face is funny - sort of like Shelley as "Blue Man Group"
You are a machine these days. Looking forward to hearing about your upcoming run! Wow all that running is fantastic - you are doing awesome. When I grow up I want to be you! It just is amazing to see your strength and endurance! Ricky Bobby still makes me laugh when you say it! Great job on the 6 miler, you are doing so awesome!! Good for you. I love all the running tips that You share. I hope to find my runner within so I am taking notes! I also did exercises during Loser; I remembered you had said you were going to do it last week and forgot. I was bored last night; my favorite is watching the workouts and this was just a lot of peoply stuff. I was thinking about you today on my run (good 3 miles) where you talked about being with the "real runners" vs. the runners like us. I am so with you there; at races, and especially at the Tri. There are the real athletes and then me. 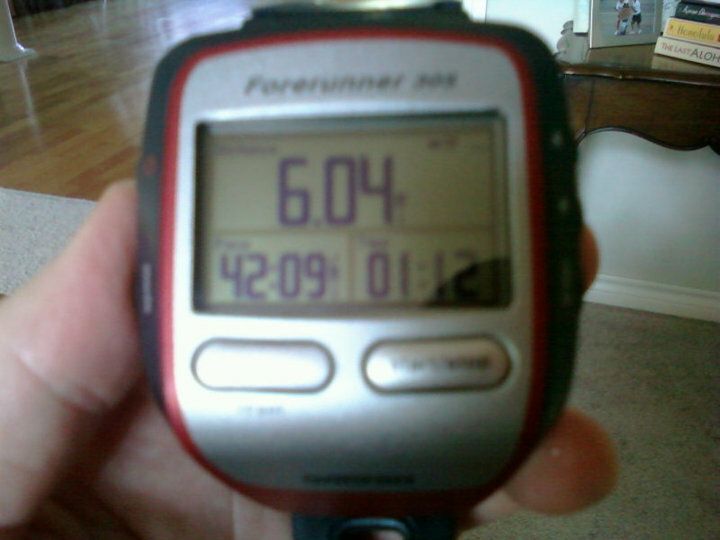 I was also thinking about my 8k on Saturday and when you talked about being last and where to line up at the start. Let's do this together virtually. I am going to be a wreck!! Those little gels, drinks, or whatever do refresh you right away. Pure glucose that gets absorbed fast. Pretty amazing things. (Yay coconut water!!). You are going to do awesome! Get lots of rest and carb load some the day before, but not too much so you don't bloat. You are amazing! Go, Shelley! From the sound of things you're well prepared for your race. Your 6 miler was AWEsome! Good Luck. You are a total runner! Thanks for the reminder about the about the bar bells. I own 'em. Now it's time to use 'em! 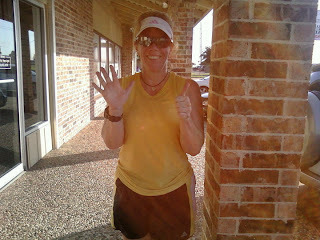 Fantastic result Shelley: 6 miles without stopping. You're a running machine! I know what you mean about your left leg. Yesterday (don't know why) my right leg hurt from top to bottom from the start till the end of my run, it was horrible. I ended up doing a short run, just couldn't do more. Give my legs running rest till Saturday and then I see how it's going. I've never taken gu's, my runs haven't been long enough for that but I'm not sure if I'm going to like it. I never brought anything else than water on my long runs which still works for me. look at me allll outta BACK FROM CONFERENCE WHACK. let me know if you want me to toss the ?? you tossed at ME out to my readers! YAY SHELLEY!!!!! You are going to do terrific on Saturday. No worries. Just have fun. I'll be thinking about you and I can't wait for the recap complete with pictures. Go make Ricky Bobby proud. PS. This weather has been soooo nice. I don't want it to end! ever. You are a complete star! Before I fell off the face of the earth, you were just facing your first 5Ks and now you're prepping for 10 miles! Go! Go! Go! Ok, I DEFINITELY want to try those sharkies! I can't stand GU and chomps and the like. Ew. Congrats on the run and that super fast pace of yours! Holy smokes!!! You'll do GREAT in the 10K. I just know it! Have you tried the chocolate outrage GU? If you put it all in your mouth at once, you can pretend you just ate jello really fast.